The Old Dutch Mustard Co. was founded in 1920 by Vladimir K. and Elsie Kedrovich, immigrants from Czechoslovakia. The original Old Dutch Mustard was located at 103 Mott St. just north of Canal St. in New York City. In 1922 the business moved to 399-401 Cherry St. near the East River in Manhattan, then around 1939/40 moved to this building across the river in Williamsburg, Brooklyn. Vladimir Kedrovich died at the age of 64 in 1944. According to the WGPA (Williamsburg Greenpoint Preservation Association?) weblog, "The Old Dutch Mustard Company Building was designed by Theobald Engelhardt and constructed in 1908. The Old Dutch Mustard Co. first occupied the building in 1939, and purchased it outright in 1944." 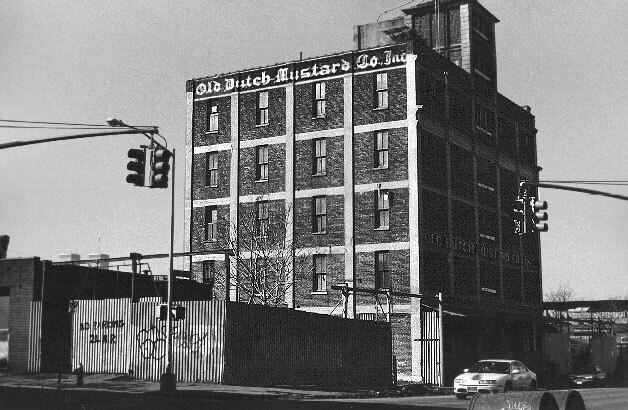 In the mid 1980's Old Dutch Mustard left Brooklyn and relocated to Great Neck, NY, where (as of 2001) they continued to process mustard flour, prepared mustard, vinegars & juices. This building was demolished in 2006. Gowanuslounge.com shows a succession of photos as the building was razed.